Marshall Electronics Optical Division - 420 TV Line CCD DSP B/W CameraÂ for the automobile, industrial video, covert security, and surveillance markets. 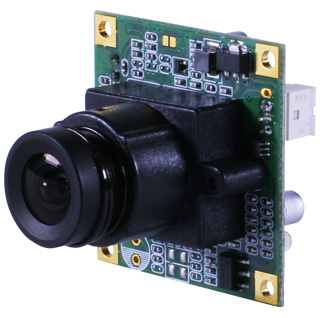 V-1217-PCB-3.7 is a special 1/3 CCD sensor single board B&W camera designed for a variety of OEM, industrial process, test and measurement, law enforcement, military, medical, scientific and security applications, RoHS compliant. The V-1217-PCB-3.7 comes with 3.7mm F2.0 92° HFOV miniature M12 lens. Camera is compatible with Marshall V-4300 CCTV Series, V-4400 HiRes Series, V-4700 Visible / IR Corrected to 1,000nm miniature lensing. C/CS lens mount version model V-1217-C/CS also available. Featuring compact 32mm X 32mm board size, Auto Gain Control, Electronic Shutter, low 12 VDC 1.2W power input, light 17g weight enables one off to tens of thousands OEM product and application potential.